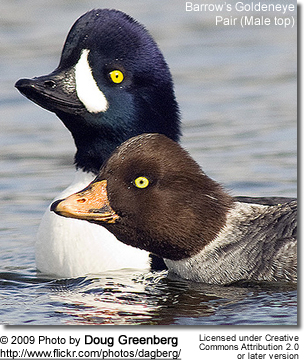 Goldeneye are small seaducks that occur naturally in the northern hemisphere. Like many ducks, they nest in tree cavities. They mostly feed on fish, crustaceans and other marine life. Common Goldeneye Bucephala clangula - Found across Canada and the northern United States, Scandinavia and northern Russia. Barrow's Goldeneye Bucephala islandica - Found in northwestern North America; at scattered locations in eastern Canada and Iceland. 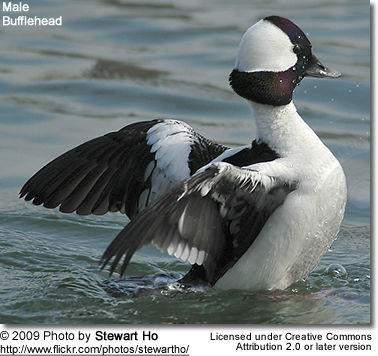 Bufflehead Bucephala albeola - Found on the east and west coasts of North America and the southern United States. Rare vagrant to western Europe. Breed in Alaska and Canada. Common Goldeneyes typically forage underwater. They eat crustaceans, aquatic insects and small fish.